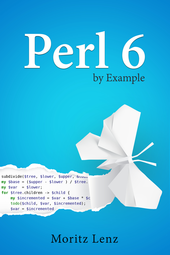 Before we start exploring Perl 6, you should have an environment where you can run Perl 6 code. So you need to install Rakudo Perl 6, currently the only actively developed Perl 6 compiler. Or even better, install Rakudo Star, which is a distribution that includes Rakudo itself, a few useful modules, and an installer that can help you install more modules. Below a few options for getting Rakudo Star installed are discussed. Chose whatever works for you. The examples here use Rakudo Star 2016.10. You can download installers from http://rakudo.org/downloads/star/ for Mac OS (.dmg) and Windows (.msi). After download, you can launch them, and they walk you through the installation process. Note that Rakudo is not relocatable, which means you have to install to a fix location that was decided by the creator of the installer. Moving the installation to a different directory. On Windows, the installer offers you need to add C:\rakudo\bin and C:\rakudo\share\perl6\site\bin to your PATH environment. You should chose that option, as it allows you to call rakudo (and programs that the module installer installs on your behalf) without specifying full paths. The option -v $PWD:/perl6 instructs Docker to mount the current working directory ($PWD) into the container, where it'll be available as /perl6. To make relative paths work, -w /perl6 instructs Docker to set the working directory of the rakudo process to /perl6. I put this line into my ~/.bashrc files, so new bash instances have a p6d command, short for "Perl 6 docker". If you go the Docker route, just the p6d alias instead of perl6 to run scripts. You should have about 2GB of RAM available for the last step; building a compiler is a resource intensive task. If you are a Bash user, you can put that line into your ~/.bashrc file to make it available in new Bash processes. $ perl6 -e "say <hi>"
If, against all odds, all of these approaches have failed you to produce a usable Rakudo installation, you should describe your problem to the friendly Perl 6 community, which can usually provide some help. http://perl6.org/community/ describes ways to interact with the community. Next week we'll take a look at the first proper Perl 6 example, so stay tuned for updates!